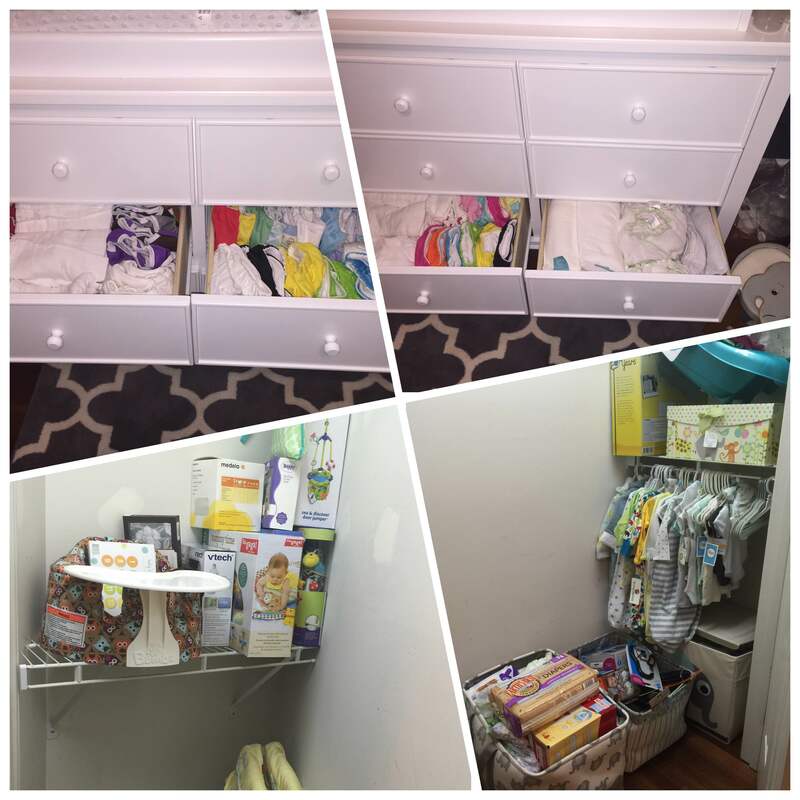 How many times can two moms re-organize a nursery? A lot, actually. 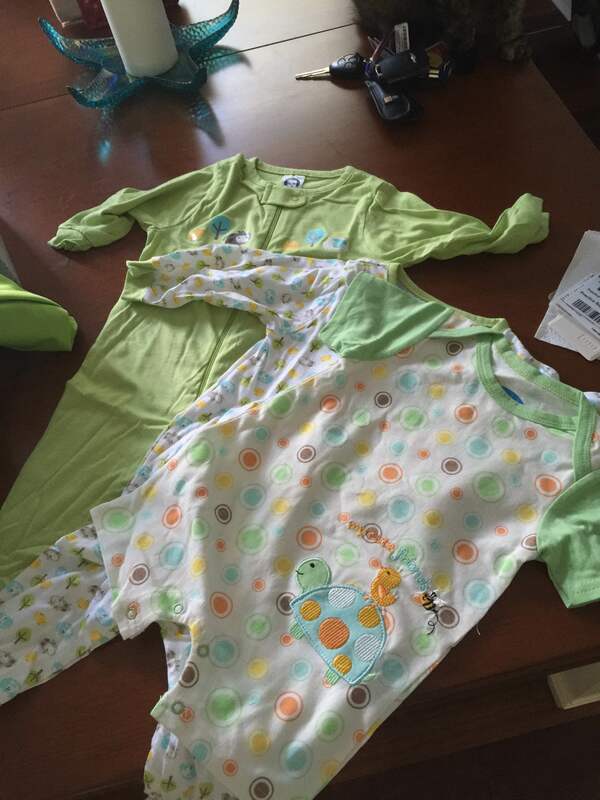 I (Machelle) can’t help it- I just start thinking about “better” ways to fold the diapers, sort the onesies or organize the plethora of blankets. Speaking of blankets- Doodle will never be cold. Doodle could literally have a blanket for every day of the month. We tried to sit down and see if there were any we wanted to return for store credit. But we couldn’t decide on any we wanted to part with. So between the ones I’ve knitted, the receiving blankets, the crochet and knitted ones from friends and family, the muslin ones, the swaddle wraps, and the home made quilts- Doodle will spend the Winter of 2015 very toasty. Plus, Fall= Doodle’s arrival. Yes I’m technically a little over 36 weeks right now, but we haven’t taken the picture this week yet- will do that tomorrow….hopefully. It’s true what they say- the last month of pregnancy is the longest. We are seeing the midwives weekly now, and that’s going well. I’ve officially let go of caring about weight gain. For the first time ever last week- I didn’t ask. When you start out pregnancy overweight, and you’re told that you should only gain 10-15 pounds, you kind of get worried you’ll get in “trouble” for gaining too much. So I watched what I ate, continued to work out- and every visit asked if I was doing okay. I have stopped. With one month to go, and 11 pounds total so far- I don’t care. I could gain a pound a week from here on out and still be fine. I don’t go crazy…but I don’t beat myself up over wanting a milkshake or chicken nuggets. I have received your paperwork and will process your leaves ASAP. 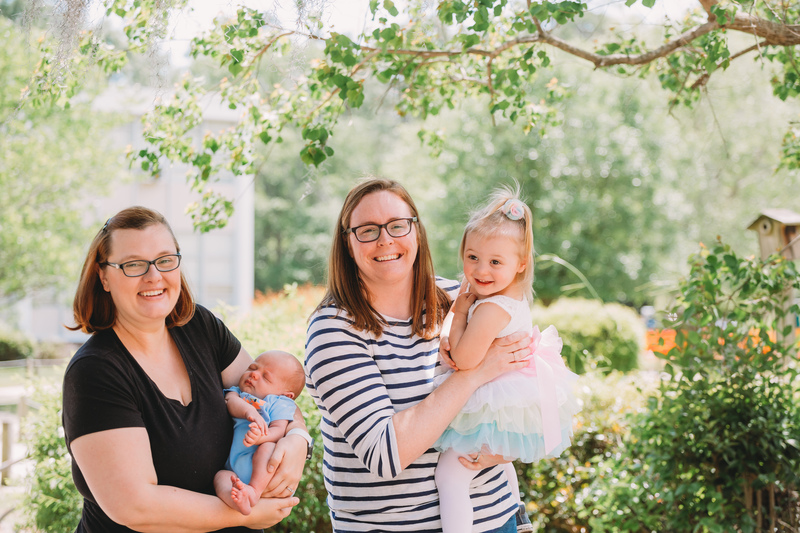 Please note that the FMLA policy has been revised, and that if both parents work at NHRMC they may each take 12 weeks of FMLA provided they do not work in the same department. So, you can both take your full 12 weeks! Just let me know if you want to take advantage of that – no additional paperwork is necessary. Thanks! Wait, did she just say we BOTH get 12 Weeks EACH?!?!?! Yes, yes she did- a new policy! Some people are afraid to come out at work- HR knows we’re married, are having a baby, and have changed the policy so that both moms can take a generous (by US standards) maternity leave? I cried, Mary cried…couldn’t be better timing. Now, in a perfect world, we would both take the full 12 weeks each and stay at home staring at and loving our adorable Doodle for 3 months. But, of course, in reality, we know that’s not feasible financially right now. FMLA does allow you to take 12 weeks- but you have to use your own accrued paid time off if you would like to have income during that time. Mary has quite a bit of PDO’s built up, but I’ve only been with the organization a year and don’t have as much. If we both took the full 12 weeks- we’d be stretched thin quite a bit, and we don’t want to drain our savings. So, for right now- I think what we’ve decided is that I will take the full 12 weeks, and Mary will take a month off when Doodle comes. When I go back to work, Mary will stay home for a couple of weeks before we start part time daycare. Still, a month of both of us home is very, very fortunate. It will still be “tight”, but we always find a way to make things work. I can tell things are “changing” with me physically. I used to read blogs or pregnancy apps and everyone talks about how they can “feel their pelvis/hips opening up”. I didn’t know what they meant. Do you feel your hips get further apart, like do you hear it squeak as it opens? I was so confused. Okay- now I get it. And no, I can’t explain it any better. It’s like weird pressure sensation of your hips widening, getting more “open” and flexible. I don’t think I’ve “dropped” yet. I still have constant heartburn and shortness of breath. But, getting up to pee 4-5 times a night. Having some difficulty sleeping, however I found sleeping in the pregnancy pillow but still had extra pillows behind me propping me up at a 35-45 degree angle. It was pretty comfortable, hope it works again tonight. I think I scared Mary a little last night. Truthfully, I even got a little uneasy. The Braxton Hicks are getting much more frequent especially in the evenings. I had been craving fajitas for like 2 weeks and Mary made them for me last night. Only thing, is that while she was making them, I started having the “b hicks”. Then the cat vomited in the bedroom under our bed. Then I started feel like I was going to vomit everywhere as the contractions started getting more intense. I panicked a little. I called out to Mary from downstairs and told her I couldn’t get down low enough to get the cat vomit out from under the bed. And then I did the only thing that ever helps me feel better- getting in the bath tub. I ran a warm bath and plopped myself in hoping the contractions and nausea would stop. Embarrassed, I had to confess to Mary that I couldn’t eat the fajitas (which she hates eating and making- the only reason we were having them was because I had wanted them for so long.) I felt so bad. I couldn’t imagine eating anything. The only thing that makes me feel better is staying the dark bathroom rocking myself back and forth in the tub. Something about feeling the water rush across my legs and back as I move is soothing. I honestly have no idea why it provides relief- but doing it makes me move my hips and distracts me- and they eventually stopped. When the contractions stopped the nausea went away…and then I wanted to eat the fajitas, which by the way, were delicious. And that whole experience reminded me that “Doodle Day” is getting closer- but reassured me that it’s possible to stay calm. 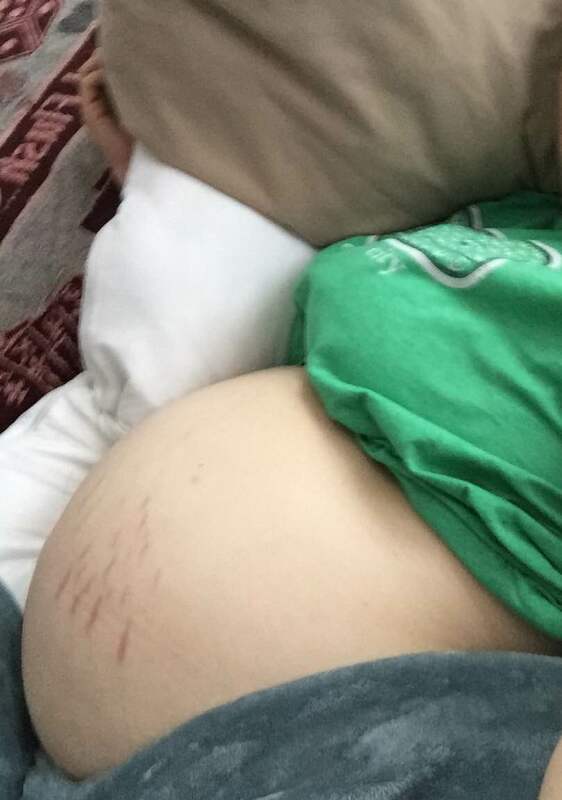 My growing belly in its favorite position- propped up with a pillow. 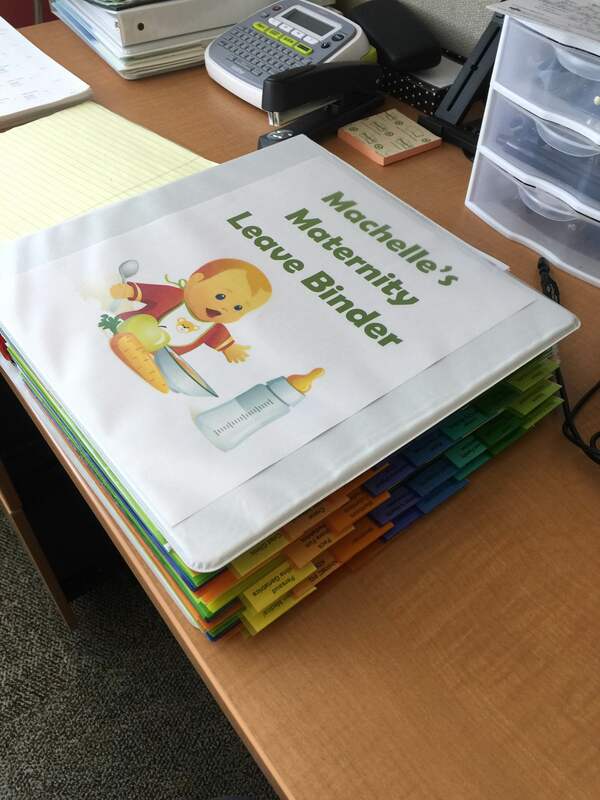 My “maternity leave” binder I made for my coworkers who will be covering my practices while I’m out.